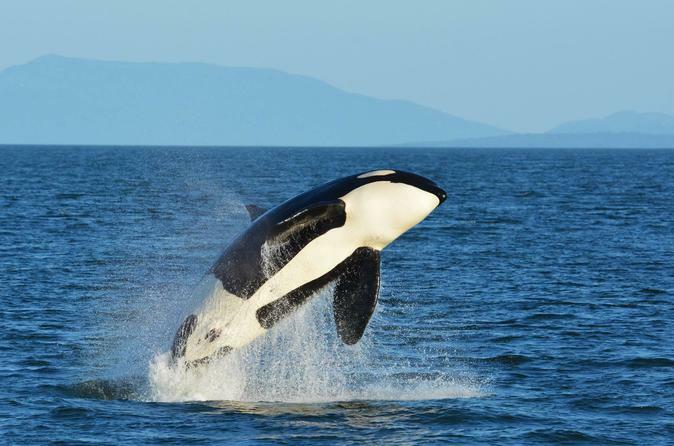 Look for killer whales in their natural habitat on this 4-hour whale-watching adventure near Vancouver, British Columbia. Enjoy a 3-to-5-hour, small-group adventure, departing from the beautiful town of Steveston, located just outside the city of Vancouver. Head out into the Canadian Gulf Islands and beyond in search of wild killer whales, humpback whales, seals, sea lions, porpoises, and more. Enter the realm of the killer whales, humpbacks, and more on this 4-hour adventure. Begin in the beautiful and historical fishing village of Steveston, then head out to the Strait of Georgia and into the islands for the ultimate wildlife experience. Onboard expert guides live and breathe the Pacific Northwest. Many of them help participate in whale research happening on the coast and their passion enhances the experience. Educational material, water, and snacks are all provided on board, but it is encouraged to bring food as the trip can be between three and five hours (or longer). Luckily, Steveston has lots of great lunch options to pick up before the trip departs. The tour location is approximately a 25-minute drive from downtown Vancouver. Having this location a bit further south means being closer to the action and the commute time to the whales is usually much shorter. There is an extremely high success rate in whale sightings, from orca, to humpbacks, and more — all in their natural habitat. If no whales are spotted, receive a voucher to come back for free.